Some consider rapper Kanye West's album name "Yeezus" and his consideration of himself as equal to Jesus to be blasphemous. 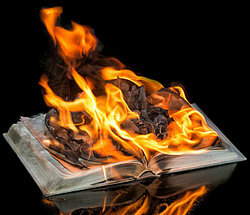 Burning a religious document such as the Bible or the Qu'ran is considered blasphemy. Pastor Terry Jones is the head of a church in Florida who, in 2010, is considered blasphemous of Islamic religion due to his suggestion to hold a "Burn the Qu'ran Day," his publication of a book entitled Islam Is of the Devil, and his purveyorship of shirts and cups that spread the same message. Islam's Prophet Mohammad is often the source of blasphemy. His image, according to Islamic law, is not to be printed yet many cartoonists and others around the world have been considered blasphemous for doing so. In 2006, Norwegian and Danish newspapers faced serious backlash and threats of retribution from Islamic nations for printing cartoons that featured Prophet Mohammad. While the act of printing the cartoons, themselves, would have been considered blasphemy unto itself, the cartoons also featured the Prophet in poses that were considered "unflattering," particularly one in which the Prophet's image was made to look like a terrorist. "Examples of Blasphemy." YourDictionary, n.d. Web. 23 April 2019. <https://examples.yourdictionary.com/examples-of-blasphemy.html>.